It needed a second half defensive masterclass to cement victory but an early blitzkrieg from table-topping Melbourne Rising proved enough for them to down Canberra Vikings 34-13 at AAMI Park last night. The competition pacesetters were at their devastating best in the opening quarter, building a 26-0 lead in only 25 minutes, in a manner that suggested it would be a long night for the Vikings. But a try to Robbie Coleman on the half hour reversed the momentum and saw the visitors dominate for large periods of the remainder of the match, only to be thwarted by Rising’s well drilled rearguard. A second try 10 minutes from time had the Vikings within 13pts but a grandstand finish was denied when replacement Luke Burgess went over for Melbourne’s fifth five-pointer to confirm their sixth win from six starts and forge an incredible 15pt buffer at the top of the ladder. Captain Nic Stirzaker conceded that his side had switched off after a blistering opening. “It was a very enjoyable start but I think we came out a bit too red hot and really plateaued after that,” he said. Vikings captain Fotu Auelua felt his side could have come away with more from the game if his side had been able to convert pressure into points. “At half time we had to change things up, I felt like we had the upper hand for the majority of the game but obviously they were just better at taking their chances,” he said. Fast starting Rising clicked into gear in only the second minute, competition leading points scorer, Jack Debreczeni, jinking his way over from 15 metres after his teammates had pinned the Vikings back with a succession of dominant phases. The 4th minute saw the Rising forwards get their place in the sun, splintering the visitors’ scrum to earn an early mental, as well as physical, advantage but a spill at the subsequent lineout put an end to a double score inside the first five minutes. Rising continued to make all the early running however, halfback Stirzaker at his probing best and ably assisted by his go-to wrecking ball, Lopeti Timani, who repeatedly got his side over the gain line. 12 minutes in and the irrepressible hosts rubber stamped their dominance with a finely worked second. Mitch Inman did the initial damage, breaking the line to carry 30 metres and when the ball was recycled, the impudent Debreczeni chipped over the advancing Vikings line, profited from the most delicious of bounces to regather and feed Telusa Veainu to the chalk for the fullback’s eighth try of the season. Six minutes later it was three, the Vikings simply offering up no resistance as Melbourne ran over the top of them. 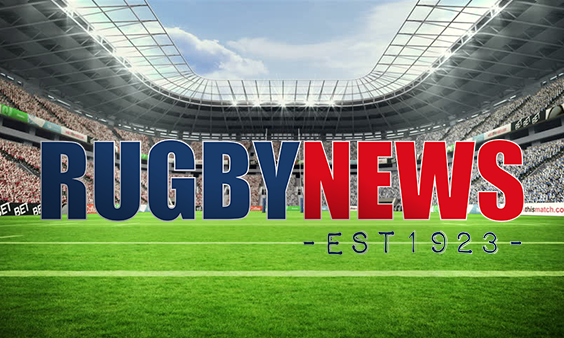 They’d threatened from the lineout maul already and it was another powerful drive that got them within inches of the line this time, and a couple of pick and drives later and prop Paul Alo-Emile slid home for a popular score. As the game entered the second quarter, the stats didn’t tell a lie. 80% territory, 75% possession and five penalties to zero, all in favour of the home side, was an accurate reflection of the one-way traffic on display. 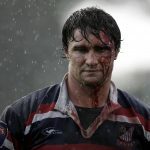 When the industrious Inman crashed over out wide on 24 minutes, fears of a similar whitewash to the 79-18 drubbing Melbourne served up Brisbane City three weeks ago were, appropriately enough, rising. However, try no.4 drew a line in the sand for the Canberrans and their mindset from the restart was palpably more positive. ‘If we’re going to go down, we may as well go down swinging’ appeared to be the mantra, as all of a sudden they put together their first patch of attacking phases and came away with a score from their first visit to the Rising 22. Nigel Ah-Wong made the initial surge and when his fellow red jerseys piled in to support, they did so with new-found brio. The forwards trucked it up again and again to drive the opposition line back on their heels and when the ball was finally sent coast to coast, an unmarked Robbie Coleman had an easy put down to get his side on the board. A terrific sideline conversion from Jesse Mogg fuelled the fire even more and a reinvigorated Vikings continued in the same vein for the remaining 10 minutes of the half. But while their intent was there for all to see, poor execution and a sterling defensive effort from the Rising frustrated any further progress on the scoreboard and when half-time arrived, the home side were still firmly in control with a 26-8 lead. The opening exchanges of the second stanza brought much of the same; the Vikings doing their best to pick up their tempo, stretch the Rising defence and find another gap. But if Melbourne’s attacking forays had been temporarily frozen by their opponent’s lift, their defensive strengths remained firmly intact. Line speed was the key, time and again the Vikings caught flat footed as the Rising line advanced and choked the visitors out of their building rhythm and after another fast and furious 20 minutes, neither side had managed to add to their tally. A yellow card for Stirzaker couldn’t even open the door for the Vikings, the halfback grateful that his team mates efforts without him prevented his absence from making any real impact on proceedings. 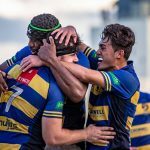 They continued to hold firm when lock Cadeyrn Neville also went to the bin just as Stirzaker’s enforced sabbatical ended, but after almost 17 minutes with a man disadvantage, the Rising line finally cracked as Mogg glided into space and put the promising Jerome Niumata over in the corner. It proved to be the Vikings last real shot in anger and with less than five minutes remaining, replacement Luke Burgess sent the home crowd away with a broader smile on their faces when he pounced off a short pass to dive in from 5 metres. Guilty perhaps off putting the cue in the rack a touch early, Rising still looked like they had another gear in hand if needed. And while everyone involved is keen to play down their title chances, six wins from six at an average of 49pts per match is some standard to have set with only four regular rounds remaining. 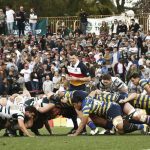 Shute Shield Power Rankings: Where does your team stand after round three?